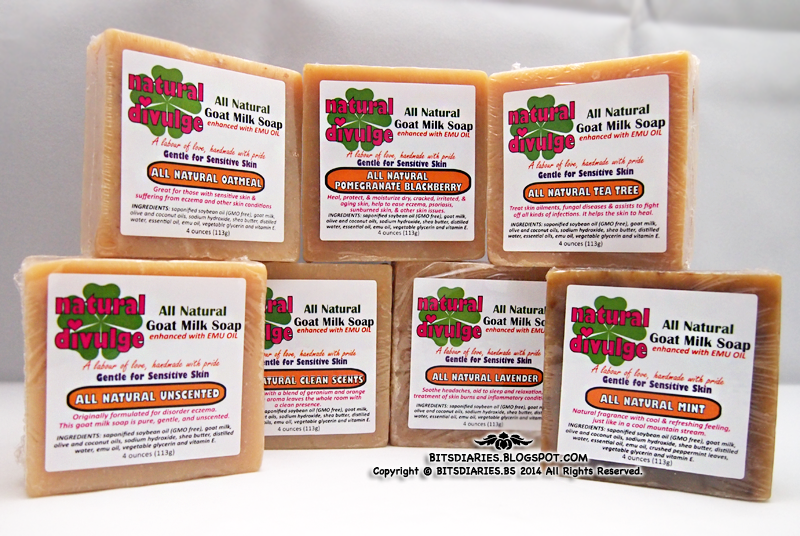 Natural Divulge's cleansing bars are of a non-detergent, non-cosmetic, non-drug variety. They are produced completely from scratch, by hand, using the ancient cold process method of saponification. 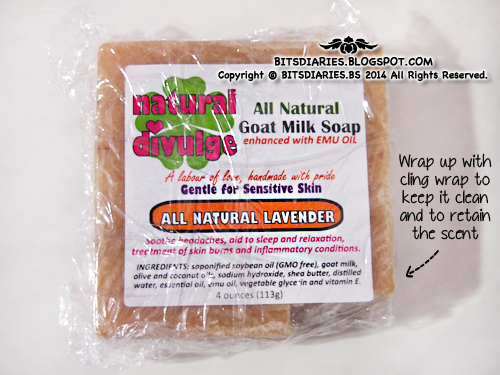 Our goat milk soaps are considered to be “true” soaps by definition. What does “true” soap, cold processed, and saponification mean? The definition of soap, according to Wikipedia Encyclopedia are as follows: “Soap, consisting of sodium (soda ash) or potassium (potash) salts of fatty acids is obtained by reacting fat with lye in a process known as saponification. The fats are hydrolyzed by the base, yielding alkali salts of fatty acids (crude soap) and glycerol. Many cleaning agents today are technically not soaps, but detergents, which are less expensive and easier to manufacture.” What this all means in layman’s terms, is that the cold processed method of making “true” soap is to mix a strong alkali (typically lye) with fats. Water serves as the vehicle causing a chemical reaction called saponification. After saponification takes place, the end result is crude soap (“true soap”) and glycerol/glycerin. It is important to note that once saponification, or the chemical reaction has occurred, there is no lye present in the final product. The majority of commercial products available on the market today are made by large conglomerates, mass produced in huge batches using a manufacturing process that removes the glycerin, and adds fillers such as synthetic detergents, hardeners, colors, and other various additives. Why do they remove the glycerin? Because they can use it to make other things to be sold separately - basically, they make more money by removing it and using it elsewhere. But what they’ve really done is remove one of the soap’s moisturizing components. By definition, these products are not soap at all. The detergents contained in them are what typically causes very dry skin and the removal of the glycerin with its moisturizing properties doesn‘t help either. Detergents along with other additives can also cause irritations in some. True soaps such as ours, made using the cold process method, retain their glycerin and have no detergent fillers or other such additives. They actually add a little additional glycerin to our soaps. - What is melt & pour soap? This is another important thing for you, the consumer, to be aware of. Melt and pour soap products are created using commercial soapmaking kits. Producers of these soaps often mislead the public with their advertising or labeling, by claiming that their products are “handmade”, or that their product contains “no lye”. In reality they are simply pre-made, commercial soap product kits, melted down, colored, scented, etc. and then poured into molds. These products are by no means handmade or made from scratch. The statement of “no lye” that some make, is extremely misleading. No “true” soap contains lye. As mentioned previously, after saponification occurs, there is no lye in the final soap product. Don’t be fooled or mislead. 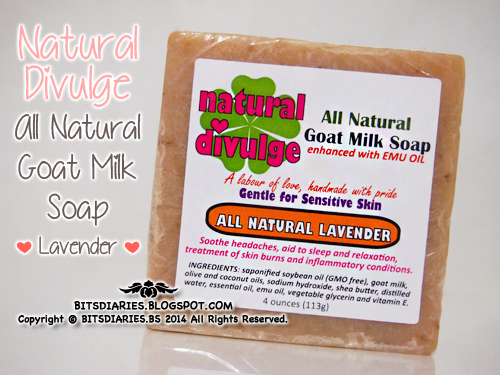 Natural Divulge places a huge emphasis on the quality of our all natural, handmade goat milk soap products, the ingredients, and the processes involved in producing them. They take great pride in their personalized customer service, and in always operating their business in a responsible and helpful manner. - All natural goat milk soap enhanced with Emu Oil. - Gentle for sensitive skin. Description of "All Natural Lavender" Body Soap— Soothe headaches, aid to sleep and relaxation, treatment of skin burns and inflammatory conditions. Made with real crushed lavender buds. Enhanced with Emu Oil. Instead of wetting the whole soap bar, try cutting chopping it into smaller pieces. By doing so, helps to extend the usage of the soap bar. I use that small cut-out piece of soap once a day. 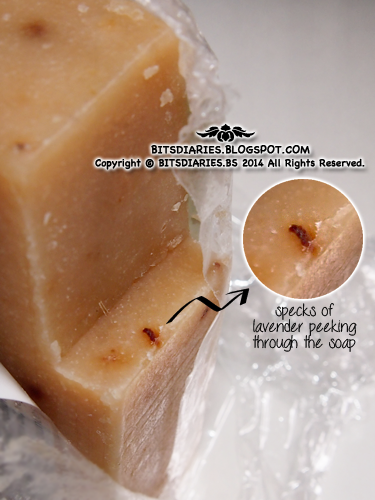 Since it's lavender soap bar, I usually use it at night to relax myself after a long tired day. It can lasts for about 5-7 usages, depends on how much you use and also the number of times you get it in contact with water(especially with warm water). The moistest the soap bar is, the faster it will soften and melt. After cutting the proportion you needed, wrap up the rest of the uncut soap bar with cling wrap to keep it clean and fresh. By doing so, also helps to retain the scent. Then store it in a dry place, away from the sunlight. That's all for the tip! Moving on to... the test on the "Lather .aka. Foaming Ability"
As you can tell from picture, it lathers up easily. Then rinse it off... It is easy to wash off with water. Creamy and quick to lather. It does not have a very greasy feel even though it contains some oil ingredients. Just like the name "All Natural Lavender", it does smells like lavender! It has a very pleasant and relaxing scent. Omg, I can't express how much I loooooooooooove the scent! When I first got the soap, I keep sniffing it as if I'm a drug addict. lol. Before using the soap, my skin moisture level is 31.4%. 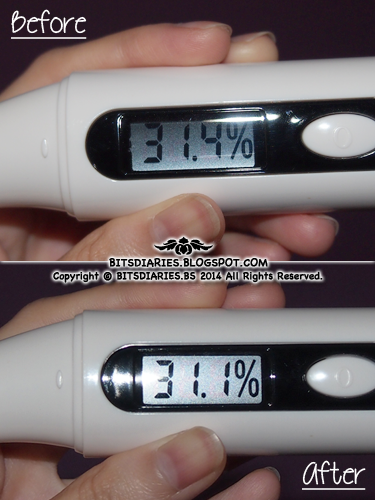 After using the soap, my skin moisture level dropped to 31.1%. The difference on moisture loss after using the soap is 0.3%. Therefore, I concluded that this soap is not too drying. - I find soap bar is less convenient. Comparing soap bar to bottled shower gel/soap, I still prefer bottled shower gel/soap as it seems more convenient for me. 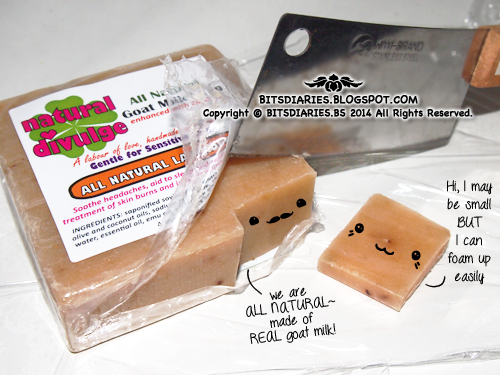 Verdict: So far..., this natural goat milk soap has not cause any skin problems on me. I would say it is really gentle and the lavender scent is really calming and relaxing, which is great for relaxation purposes. It lathers up well and it gives a squeaky clean feel after use, which has a similar feel as the Life Buoy Shower Gel. Some people might not like the "too clean" feel but don't worry, after awhile that "clean" feel will diminish. It does not overly dehydrate the skin; I guess its mainly because it contains well-known natural moisturizing ingredients such as the emu oil, shea butter, olive oil etc., which help to replenish and retain the moisture in the skin. 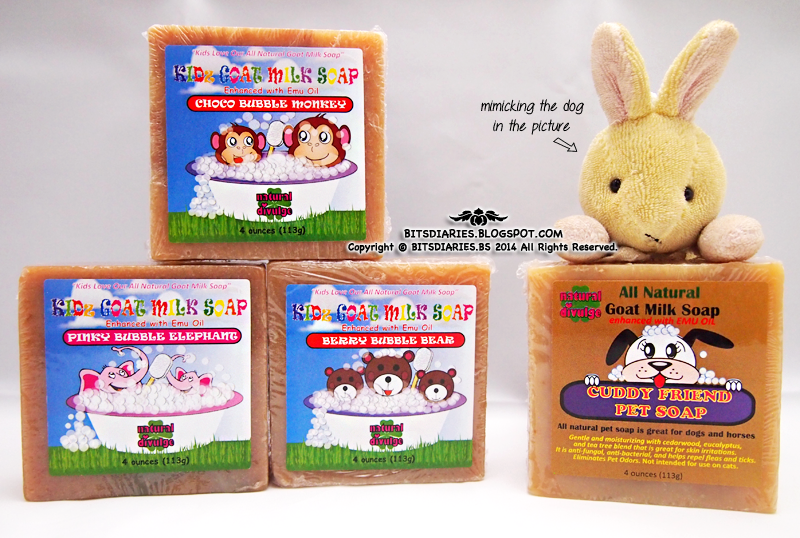 Besides that, all the soaps are made of goat milk which is full of nourishing properties! With all these nourishing ingredients(e.g: emu oil, goat milk etc. ), it's actually value for money~~ FYI, my personal favorites are the Lavender and Clean Scent. If you likes sweet scent, you can try the Pomegranate Blackberry. If you suffers from eczema and other skin conditions, get the Oatmeal soap. If you have back acne, go ahead and grab the one with Tea Tree extract. If you are looking for a soothing and relaxing scent, pick the Lavender one! If you are looking for a refreshing scent, pick the one in Mint! If you like looking for a light scented/mild clean scent, get it in Clean Scents. You can pick more than one scent and rotate different scents everyday or each time you bath. e.g: In the morning, you can use the Mint scented soap to give your body and mind a boost and get you going each morning. Then at night, you can use the Lavender scented soap to help relax after a long day of work/school. Alternately, www.mamaonlinestore.com is selling them as well! You can grab one from them too. Aww thank you for reviewing this product. Its very detailed and helpful.